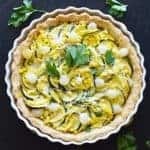 What to do with a surplus of zucchini and yellow squash from the garden? 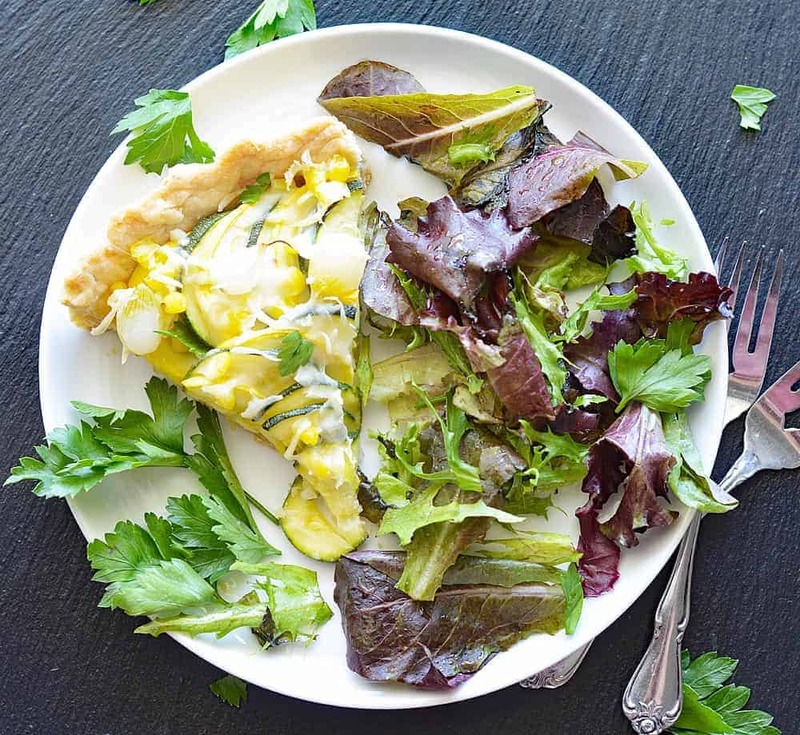 How about this Vegan Summer Squash and Corn Tart! I made my own crust, but feel free to purchase your favorite pastry dough to make this recipe even easier. 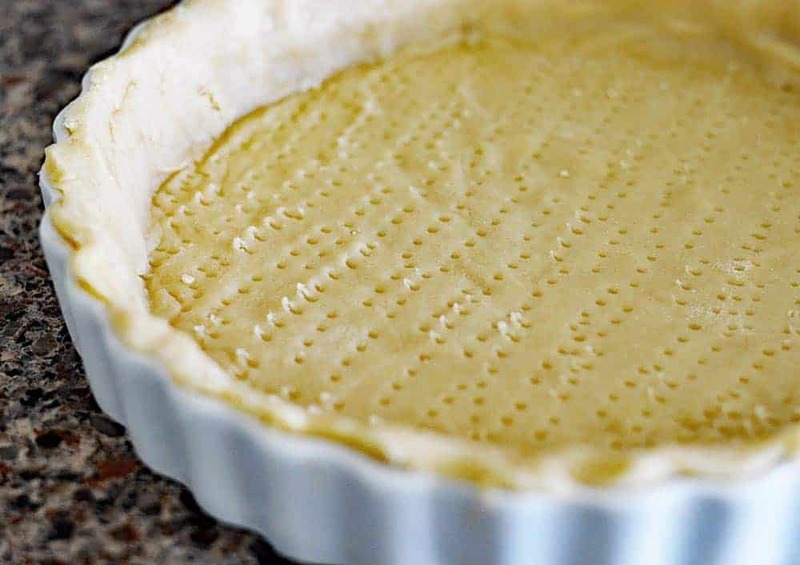 I use a variation on my favorite pie dough recipe from Ina Garten. I cut the measurements in half and also omit the sugar in her recipe. I use a food processor which makes things super quick. Fit it to your pie dish and dock it with a fork. 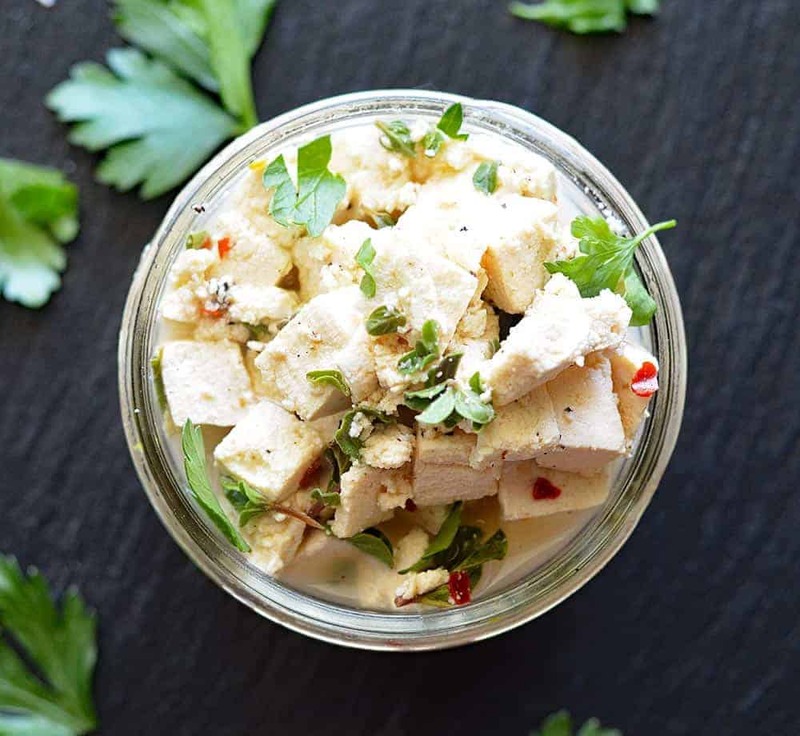 Return to the fridge while you prepare the rest of the ingredients. 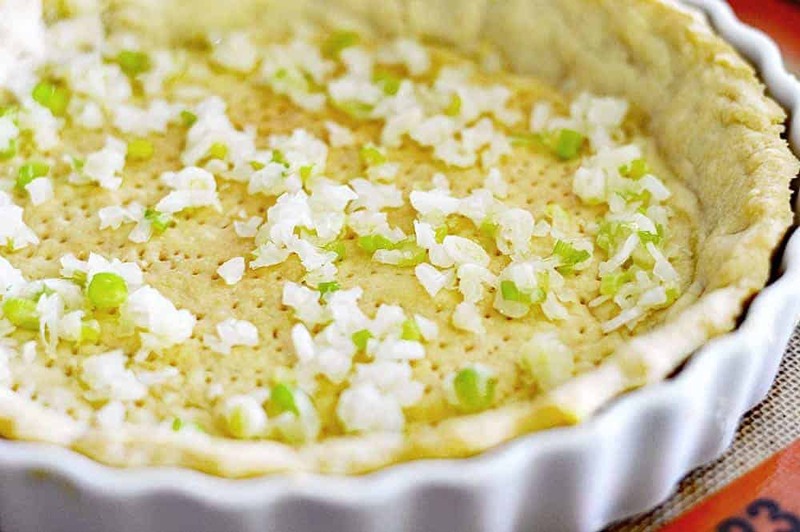 After the onions, scallions and garlic are sauteed (and cooled) they go in the bottom of the PAR-BAKED pie crust. Top the onion mixture with the vegan mozzarella and vegan parmesan. Next up, we slice and layer the squashes! The final ingredients are the par-cooked corn and pearl onions. Top with more cheese and a sprinkling of salt, pepper, herbs of choice and parsley. Bake until the crust is golden and the vegetables are tender. Allow to cool for just a few minutes before cutting. 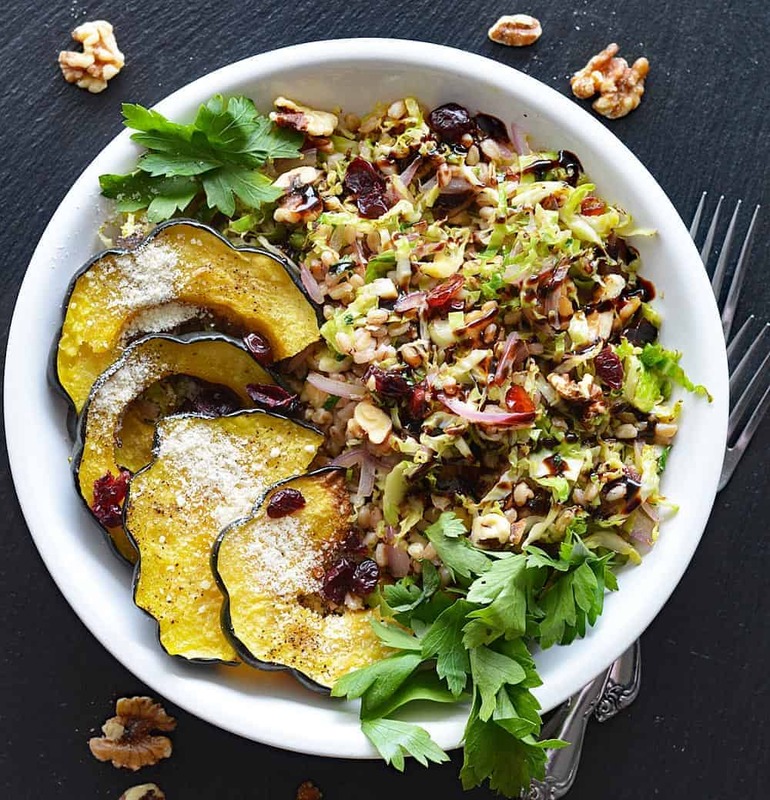 Serve with a salad of mixed greens. 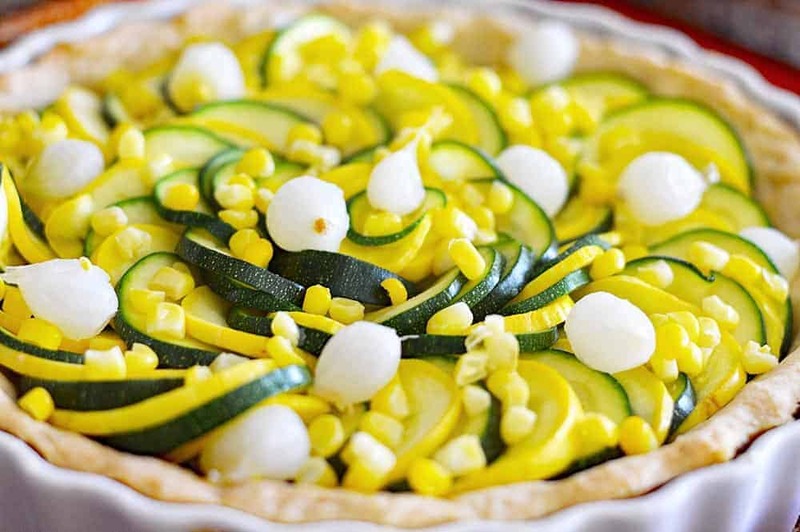 If you’ve made this Vegan Summer Squash and Corn Tart, let me know what you think! What you enjoy them with?? Leave a comment below. OPTIONAL Herbs, such as thyme, parsley, etc. Add all of the ingredients except ice water to the bowl of a food processor. Pulse until coarse crumbs are formed. With the machine running, pour the ice water down the feed tube and pulse the machine until the dough begins to form a ball. Wrap in plastic wrap and refrigerate while you prepare the filling. At least 30 minutes. After 30 minutes, roll the dough and fit to your desired pan. Dock with a fork and return to the refrigerator. To par-bake a crust that will be baked again later: Bake at 400° F until the crust just begins to brown (it will still be pale, but it should not look like raw dough). This time may vary based on your oven and your pie plate, but should take around 15 to 20 minutes. In a saute pan, add the oil, scallions and onion. Saute until the onions are translucent. Add the garlic and saute for just 1 minute more. Remove from heat. 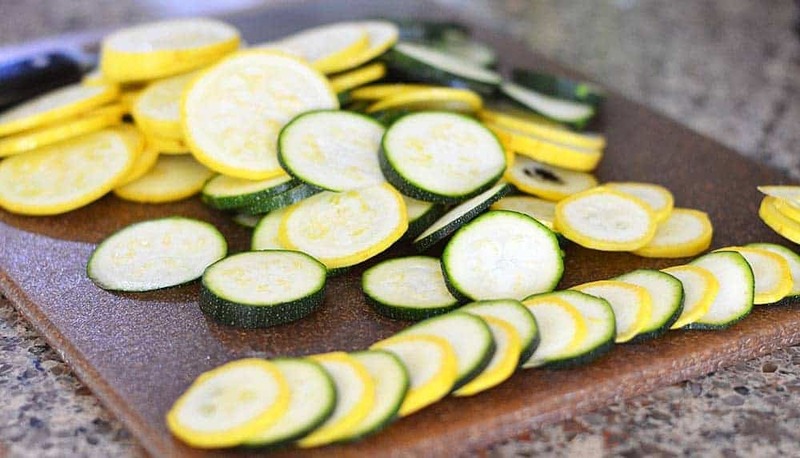 Meanwhile, add the sliced zucchini and yellow squash to a microwave safe bowl and cook for 3-4 minutes or until the squash is par-cooked. Par-cook the corn and pearl onions in the same manner. Add the cooked onions to the bottom of the pie dough and top with a layer of the vegan mozzarella and vegan parmesan. 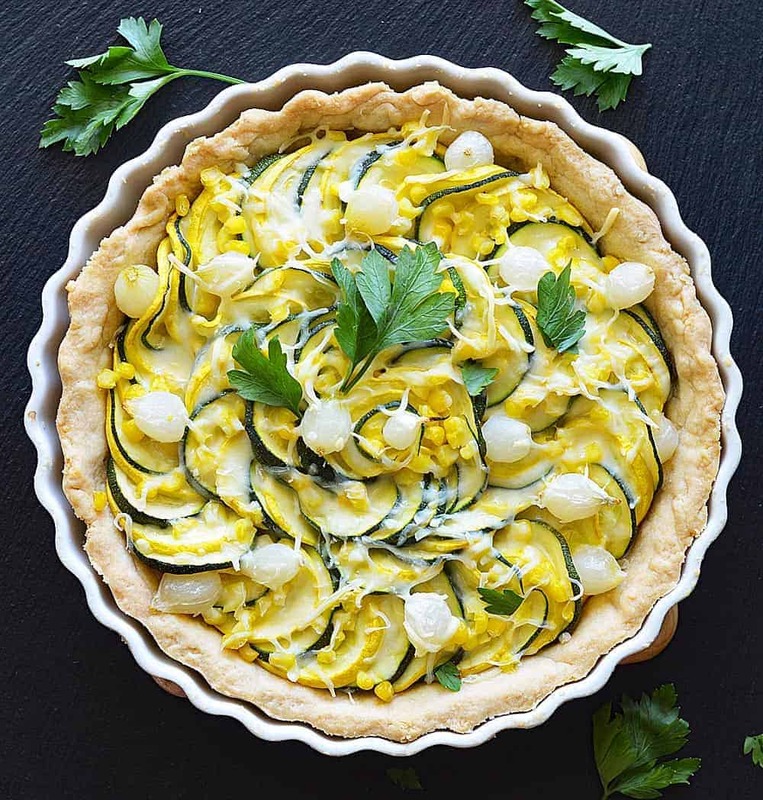 Layer the zucchini and yellow squash. Top with the corn and pearl onions. Finish with another layer of each of the two cheeses and parsley (or other herbs as desired). Season with salt and pepper. 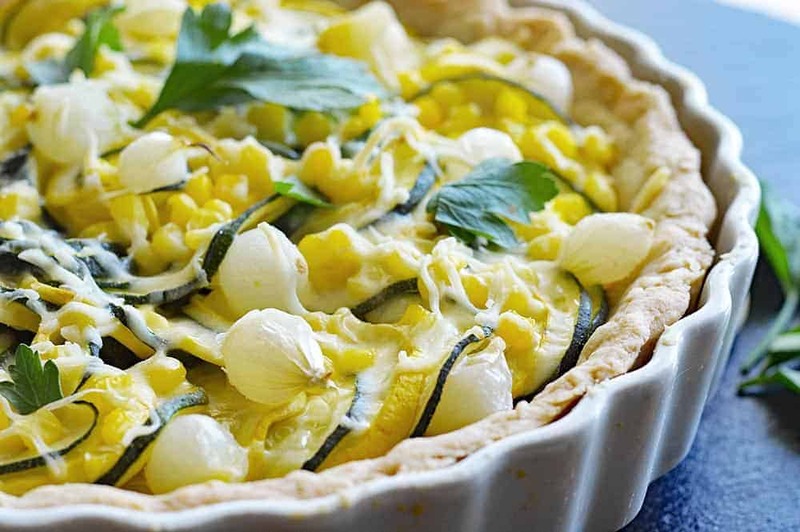 Bake for about 30-40 minutes or until the crust is golden and the squash tender. The description calls for filling a par-baked crust but the instructions don’t say anything about that step. I’m guessing I’ll have a soggy douughy crust if I skip it, but how long, what temp, etc?